I'd been looking forward to this book since the day I heard about it. It's always nice to revisit characters you already know and love in new stories. Stars Above is a collection of short stories that let you do just that. 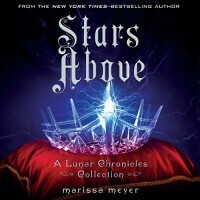 Most of them are backstory and critical moments of the main characters from the rest of the Lunar Chronicles series. It was great to get a full picture of these key moments for them. There are three new stories, though. The Little Android, Mechanic and Something Old, Something New are not backstory. I've loved the characters since each of their appearances in their respective books and gushed about them then (Cinder, Scarlett, Cress, Winter and Fairest reviews at their links). It was also great to hear Rebecca Soler's voice again as she narrated this book as well. The excerpt from Heartless was good. It didn't make my heart flutter like CInder had, but that's to be expected. The concepts are not similar enough to create the exact same reaction. I love a fairy tale reimagining more than I can possibly express, and my affinity for Alice in Wonderland just isn't as up there. Meyers is a wonderful writer, though, so I'm sure I will still love it.